Microsoft's phone business is not doing well at all. The company shipped 2.3 million handsets last quarter, but actual sell-through numbers were even weaker. According to the company's Amy Hood, the calendar first quarter ended with plenty of Lumia inventory in the company's sales channels. This can lead to a drop in orders for the new quarter, and the return of unsold units to the manufacturer. According to a tweet from Windows developer David Mealo, the solution to reducing inventory in the sales channel is to offer a BOGO deal. Mealo says that tonight, Microsoft will announce the deal. 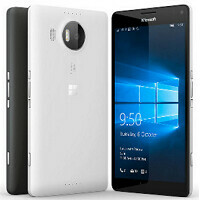 He says that the BOGO will work like this: Buy the Microsoft Lumia 950 XL and get the Microsoft Lumia 950 for free. Keep in mind that the BOGO deal is totally speculation at this point. Still, if Microsoft does want to reduce its inventory, this would be a good way to accomplish that goal in a timely manner. If you are gonna do BOGO, then I should be able to get the equally same model free. Not lesser model. No one is gonna buy it anyways. How about. Buy a Surface Pro 3 and get the 950 free and get the Surface Pro 4 and get the 959XL free. Buy a Surface Book and get both phones at 50% off. This make sense but Microsoft lacks common sense. Buy a surface get a lumia would be worthwhile. Bogo is pretty much worthless at this point. Sorry but I am completely pissed off with how bad that phone was at launch. Huge let down. The phone was fine - very good, in fact. The OS was not ready. Minus the creaky back, yeah the hardware was on par with any other flagship. D-Bogo "Don't buy one get one"
So this is pretty much a buy one get one free deal...if true. Why not just offer them at almost 50% off then. I'd go and buy one tomorrow for that deal. It's BOGOF you idiots, not BOGO. There's no point in BOGO without the "F" FREE part. Who's in charge of making up these acronyms? Probably some stupid person under 30. BOGO has been around for awhile like decades..... Buy One Get One, you cant really say the word free, because you had to spend the initial investment. So free would not be the right term. Free is not the right term? Bullsht. The "initial investment" is included in the "Buy One" part, so that makes the "Get One Free" part is 100% correct. And you don't have to include, 'free'. Buy One Get One, is all that is needed. Yeah right, if "Free" is not needed then they can always tell you Buy One Get One for full price or only 10% off. LOL!! Works for retarded people with no brain. I wouldn't get one if they were for free. No apps, no high end specs, no top notch screen, no high end materials, so NO GO for me. No high end specs or top notch screen? http://www.phonearena.com/phones/Microsoft-Lumia-950-XL_id9545 Um, what? Screen is absolutely top notch. As is the camera. Microsoft is responsible for the failures of their devices especially the 950 and the 950 XL. The prices were just a no go area coupled with the fact that there is enough competition. Moreover, lot of people like me has never used a windows phone and to take the risk of parting with $700 just to get the 950XL is not an easy decision to take. I was very interested with the 950 XL but the price discourage me and I believe there were a lot of other people who got discouraged by the price too like me. Next time, they should get their pricing right and we will venture to buy them. You have to make money. So while we always want free, at the end of the day, not a single android device offered all it had in one package...other than a OS difference and app difference. Speaking as a WP fan - you are correct EXCEPT that Windows Phone needs to get more of a foothold. For a large, hyper-profitable company like MS that means taking a short-term hit in profits to better position yourself for the future. I completely agree, however, you can never know how it will turn out in terms of returns. This is no different than Samsungs S7 Bogo through carriers, so I don't think its fare that they didn't do some kind of 'inventory' fire sale type article with the S7. But I do get it. Consoles are sold at a loss, I wonder why Phones can't be treated as such. Difference though is that Balmer loved windows phone and the windows ecosystem and threw money at it. Sadly he failed certain milestones. But you can tell the difference with him there, and with him not there. They have squandered the Nokia purchase, they have squandered what little share they had. Sure they hope to make a big splash with the surface phone but with whom? Unless windows phones ditch ARM all together, and their continuum is a stepping stone into x86 Continuum where the phone will run x86 apps in continuum mode. They are loosing their own race to loose. Personally I would take your approach. I would be bundling mid-tier phones with xbox one purchases. Bundle high end phones with the Surface Pro 4 and Surface 3. Bundle the s**t out of it. Take that Billion dollar loss. Open up credit for the online store so people can buy it like they do at a carrier with little up front cost. They need to shove it downs peoples throat like their competition has, like they used to do to get to the #1 desktop spot in the first place. Google out MS them at their own game. As a WP fan, I don't get ANY of thier sales straegy on the 950 or 950XL.. Bundle two phones no one knows about on a sale on thier website no one goes too. Instead of sending the phones to the Best Buy MS Stores, or selling the 950XL through T-mobile ( they said they would take it and it wouldn't need anything done to it ). They could bundle it with a Surface Pro at the BB stores and it would sell great. ! But that would make sense.. and well their love of launching all their good phones with AT&T is proof they have no idea how to sell the phones. YET their Surface group knows how to make and sell tablets. Go figure that one out. Lets not forget at launch they had them for sale to the US for all of a day. Then anyone wanting one had to wait until after Christmas due to collusion with AT&T. They Screwed up the launch so royally its not even funny. Now they have MS stores in all teh Best Buys, and STILL Don't sell the phone there..? Its like they are trying to fail. The ad/sales staff should be fired. "Phonearenia" is the name of the country. Problem is that's not the point. If you you you've continuum like I have its actually pretty good feature its like turning you phone into a cool apple TV. I see kids with 700 buck cell phones and struggle to get a pc too. (parents are a bit tard). So target mid-tier continuum phones with a phonelap dock and the kid has all they ever need in school.